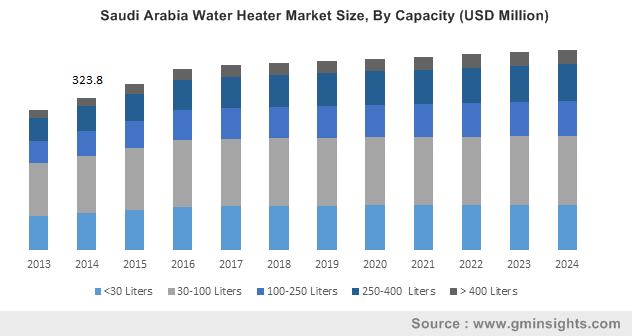 Saudi Arabia Water Heater Market size was valued over USD 450 million in 2017 and is set to expand over 1.7% by 2024. Saudi Arabia water heater market will witness an appreciable growth on account of significant economic transformation and rapid urbanization in the country. The growth in the sector is attributed to the rising population, transitioning family structure, and changing demographics. In addition, an appreciable increase in disposable income as a result of urbanization will further reinforce accessibility & affordability of these products. According to the United Nations, the urbanization in the country, in 2017 was reported to be higher than that of several densely populated Arab nations, including Iraq, Egypt, and Syria. Ongoing construction boom reinforced by increasing legislative spending will drive the Saudi Arabia water heater market. Several mega projects including King Abdullah Financial City, which are focused toward consolidating national infrastructure will further create prospects for the industry expansion. Riyadh, Dammam, Jeddah, and Mecca are emerging as the major hotspots, which are witnessing the highest adoption these products. Growing consumer inclination toward energy-efficient products driven by increasing stringency of regulatory requirements will stimulate the Saudi Arabia water heater market. For instance, the Saudi Standards, Metrology and Quality Organization (SASO), in January 2018, introduced mandatory Minimum Energy Performance Standard (MEPS) and testing requirements of different types of water heaters in the country. Recent developments in efficient heating technologies will further accelerate investments in the industry. Saudi Arabia solar water heater market is anticipated to expand over 11 % by 2024. Growing legislative interest toward the utilization of abundant solar flux aimed at environmental sustainability and economic diversification will propel the industry growth. Progressive enforcement of energy codes for new buildings and for alterations to the existing will further support the deployment of these products across households and commercial establishments. Instant water heater market will witness robust growth on account of strengthening consumer preference toward energy efficient tankless heating solutions. Durability, lower energy & operational costs and ability to eliminate standby energy losses are some of the key factors that will boost the product adoption. These are often referred as non-storage or tankless water heaters that provide instant hot water on demand. Electric water heater market will continue to witness growth on account of sustained low electricity prices across Saudi Arabia. These water heaters operate on electrical power and may operate as a storage or an instant heater. Rising disposable income driven by sturdy urbanization in the country will propel the <30-liter water heater market. The predominance of these water heaters typically lies across the residential establishments, on account of their operational suitability and compact sizes. The ability of these units to mitigate space constraints while providing adequate hot water supply will strengthen their product adoption, majorly for residential purposes. The > 400-liter water heater market will witness growth on account of their application suitability for commercial and industrial facilities. Processing plants, paper manufacturing, food processing, metal finishing plants, water and wastewater treatment plants typically involve the use of these heaters. Residential water heater market will witness robust growth on account of a multitude of economic, demographic, and regulatory factors. These factors primarily include a potential rise in household income, relatively lower housing ownership, burgeoning population along with changing family structure. The exponential rise in the demand for water heating is further accelerated by the flourishing urban sector across the country. Commercial water heater market is anticipated to grow over 2 % by 2024. These products are primarily deployed across hotels, restaurants, stadiums, shopping centers, schools, universities, public buildings, and other commercial establishments. Sizeable investments toward the reinforcement of the country’s infrastructure as part of Saudi Vision 2030 objective will entail large-scale deployment of these units. 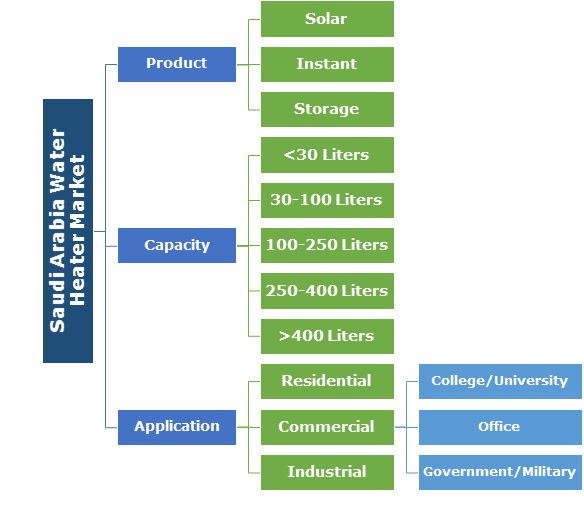 Notable industry players across the Saudi Arabia water heater market include A.O. Smith, Rheem Manufacturing, Bradford White, Saudi Ceramics, Bosch, Ariston, Ferroli, Rinnai, Viessmann, Vaillant amongst others. Product accreditations, after sales service, cost competitiveness, along with an extensive distribution network are some of the key strategic assets to gain a strong foothold in the industry. Companies across the value chain are pursuing innovation in the sector supported by technological advancements, emerging geographies for both supply and demand, and a growing propensity toward energy-efficient consumer products. A water heater is defined as an apparatus which operate on an energy source to heat water above its initial temperature for residential, commercial & industrial purposes. The energy source may be electricity, solar energy or a fuel including natural gas or propane. These products are deployed to transform thermal energy from a fuel source to a reservoir or stream of water.